Thousands of Second Amendment activists across the US took part in a Day of Resistance against President Obama's gun control measures, calling his plans unconstitutional. Words are not all they’re prepared to use to protect their right to bear arms. People gathered at dozens of cities and towns across the United States, crowds numbering from a hundred to a thousand people. They were carrying American flags and banners with words of harsh criticism against Obama's proposed gun control regulations. "Come and take it!" "Dictators Want You Disarmed," "Honk If You Want to Keep Your 2nd Amendment" and "Don't tread on me" were among the most common slogans. 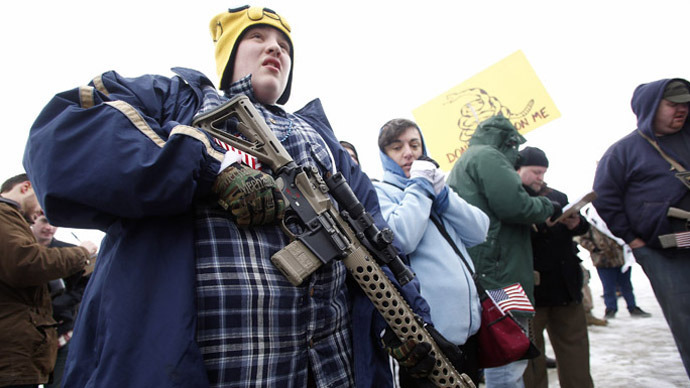 Protesters believe owing a gun is a basic right of every American citizen. "This isn't a Democratic thing, or a Republican thing, or a Tea Party thing, this is an American thing. This is about the rights this nation was founded on," Ryan Studabaker, rally organizer from Bluffton, Indiana, told Wane.com. Based on production data from firearm manufacturers, there are roughly 300 million firearms owned by civilians in the United States – roughly one for every citizen. "The 2nd Amendment prohibits the government from infringing on our right to bear arms. We want to make darn sure they don't infringe on our rights. If we lost the Second Amendment, we'll lose them all," Jerry Martin, a rally participant in Kenenwick, Washington, told NBC. It's indeed a very American thing to have so many weapons out in the open. The gun-bearing freedom has come back to the spotlight after multiple shootings that took lives of dozens at the end of 2012. 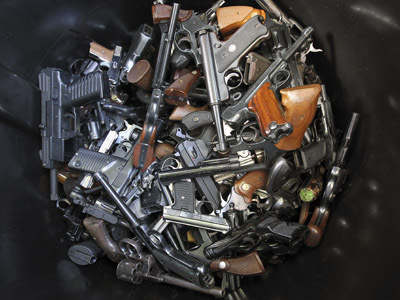 Polls reveal it's approximately a 50/50 ratio of those who want to keep to the guns and those who want guns kept away from them. 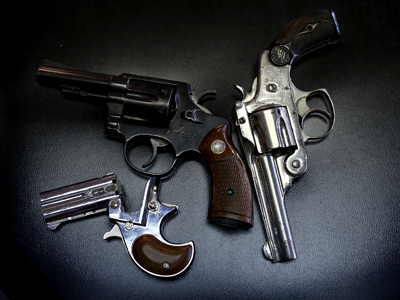 According to the Pew Research Center, 50 per cent of Americans say controlling gun ownership is the priority while 46 per cent say it is to protect the right of Americans to own guns. 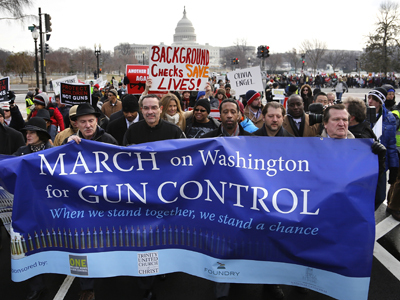 Supporters of gun control point to staggering statistics. 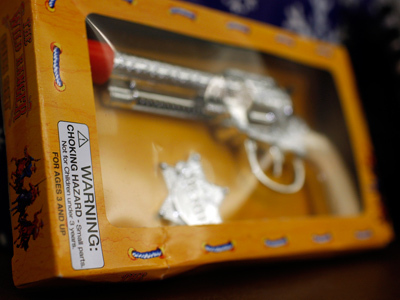 The US has highest rate of gun-related killings among developed country. This, however, has nothing to do with law-abiding gun-owners, protesters believe. A police chief in Pennsylvania, Mark Kessler, is taking a pro-gun position to a whole new level. He is training private citizens to become snipers and resist what they call a 'tyrannical government' if need be. 'I will take my uniform off and I will stand for freedom. I will not in any way, shape or form support anything that goes against the constitution or the Second Amendment," Kessler says. Sheriff associations from 11 states said they would ignore any law passed in Washington that would significantly regulate guns. "There is a tradition in American thought of states doing what they want despite what the federal government says," George Kenney, a former US foreign service officer, told RT. "Now we see the revival of the same kind of philosophy. But they are part of this country, whether they like it or not, and federal laws will be enforced." 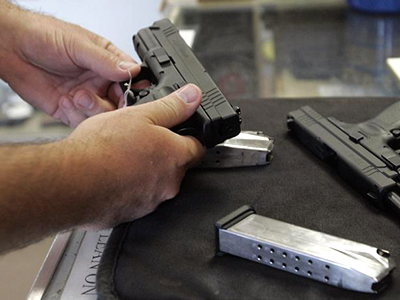 Congress is to begin considering new gun regulations within days. Obama wants a universal background check system created for gun sales as well as enhanced tools to stem the so-called ‘straw purchases’ of guns for criminals through a third person. He also calls for reinstatement of an assault weapons ban that expired in 2004 and tightening limits on the capacity of some ammunition magazines.